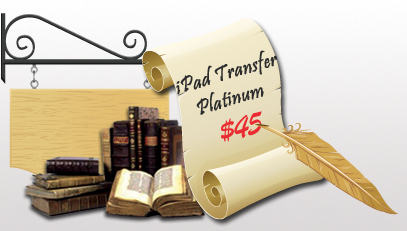 4Videosoft iPad Manager Platinum is a versatile iPad Transfer software that bundled with three software: iPad to iPad Transfer, iPad to PC Transfer, PC to iPad Transfer. It obviously means you can transfer all files from one iPad to another iPad, from iPad to PC and from PC to iPad with this iPad Manager software. Also it can convert DVD/video to iPad. 4Videosoft DVD Converter Suite Platinum offers the solution of DVD Ripper, video converter and iPod to Computer Transfer, which can help you convert DVD and video file, create DVD and transfer files for iPhone, iPod, iPad, etc. 4Videosoft iPod Mate is packed with iPod Manager, DVD to iPod Converter, iPod Video Converter, iPhone Ringtone Maker and iPhone Manager SMS, which can convert DVD/video to iPod, make ringtone and manage SMS for iPhone. There are four professional yet easy to use iPhone products in 4Videosoft iPhone Mate: DVD to iPhone Converter, iPhone Video Converter, iPhone Transfer, iPhone Ringtone Maker and iPhone Manager SMS. It can totally enrich your iPhone life. 4Videosoft iPhone Transfer is an all-in-one iPhone software. It is an remarkable iPhone File Transfer to transfer iPhone files to PC, including the videos, audios files. Along with the function to transfer music and movies from PC to iPhone. Plus, it acts as one iPhone to iPhone transfer. 4Videosoft iPod Manager for Mac also acts as Mac to iPod Transfer and iPod to Mac Transfer. Obviously, it can transfer videos, audios from iPod to Mac, and transfer audios, videos on Mac to iPod without iTunes, the formats are compatible with all iPod supporting formats. Of course, all the functions are available to iPhone. 4Videosoft DVD Ripper Platinum is the best DVD Ripper, DVD Converter to rip DVD to AVI, MP4, HD video, etc. with fatest speed and best quality. Then you can put the converted DVD to iPod, iPhone, iPad, BlackBerry, Zune and other portable players freely.